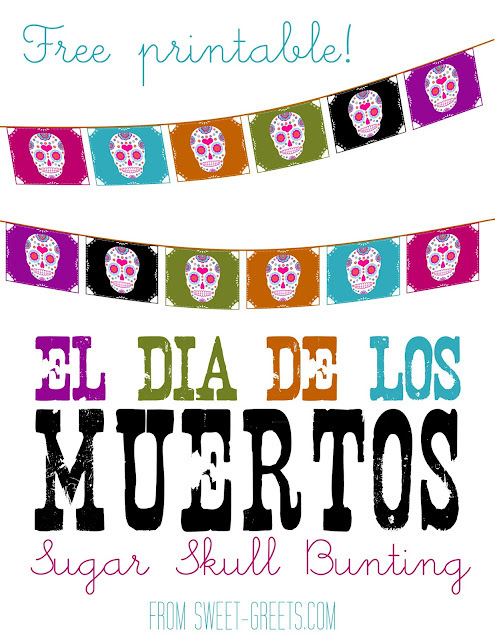 Here's a sugar skull bunting printable I've created in honor of El Dia de los Muertos. There are 6 separate bunting pieces featuring a colorful calavera, a.k.a. sugar skull, against a brightly colored background. Just click the image above to download. Print, cut, then punch holes at the top ends of each bunting piece. Arrange the pieces to your liking, then thread through with a pretty ribbon. Enjoy!